(…continued) God would much rather deal with us by speaking softly than with a stick, and how could this be made more clear than in the Christmas story? Nowhere else in the Bible does God speak more directly or more clearly than when he comes to earth himself in the person of Jesus. Imagine it, this all mighty and all powerful God–Creator of the whole universe and everything in it, makes himself small enough to visit his own creation, indeed, even being born as a baby. God could have come as an adult. God could have even come as a giant. Use your imagination– there are all kinds of great and impressive and overpowering and magnificent ways God could have come. 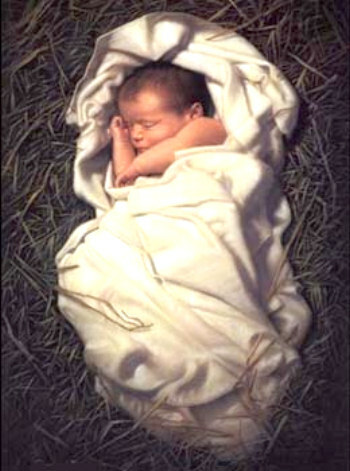 But he chose to make his arrival in the same way you arrived– as a baby– a fragile, helpless, little baby. Remember, God knows how to get the stick out, and that is a frightening thing to contemplate. In Exodus 19 when God appeared before Moses and the people of Israel at Mt. Sinai, they were all ‘terrified’ at his power and glory. When Isaiah got a glimpse of the glory of God in the Temple, he said he was ‘struck with fear.’ Job (chapter 23) said, “God has made my heart faint, the Almighty has terrified me.” Many more similar verses could be listed. This is what you would expect from an encounter with God, especially when you think about what we, his children, do to each other. But at Christmas, God does the unexpected. Think about what it means that GOD came to earth, to his disobedient children on this little speck of dust in his great universe; and chose to do so as a baby. There is other no way God could have found to come to us that would speak more softly. That is the miracle of Christmas– God, here with us, as a bawling, burping, baby. When God does his most important intervention in this world, he comes not to threaten, not to condemn, and not to judge, but as an infant. Infants do not threaten, judge, or condemn. They can’t do any of that. What can babies do? Nothing much. They usually just lay there. Babies can’t do much for us, but they can do something to us. They get our attention– all of it! They make us think about the gift and miracle of life. They teach us to be grateful for life. They gain our love and teach us to love– to love them, and to love each other more. They soften our hearts. They get our minds off ourselves and our own needs, and make us focus on them. At the same time, they make us think deeper about ourselves, and our own life. They make us remember that we too started out as a baby, and they make us think about God who gave us and them this life. Babies are wonderful– and they make us full of wonder– and they open us up to God. God came to us as a baby, not to threaten us, but to win our hearts and to teach us to love; and we know babies can do that. This song appears to have originated among German Lutherans in the early 1880’s. The first known publishing of the song was in the May 1884 issue of The Myrtle. It has often been attributed to Martin Luther, but there is no evidence for this. The music was composed by William Kirkpatrick in 1895.